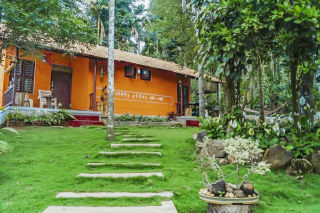 This is an offering of a well-appointed homestay that can accommodate a group of up to eight people. There are two rooms in the house and two bathrooms. 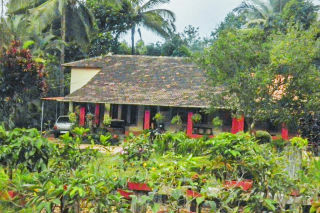 Meals are provided by the host and include authentic Malnad delicacies, both vegetarian and non-vegetarian. Surrounded by a dense cover of lush trees, the house sits atop a grassy knoll dotted with pretty plants and garden shrubbery. Stone steps through the lawns lead you up to the house. The interiors are modest, with minimal design dominating the space. 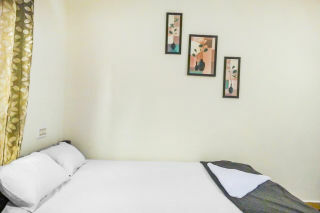 Both the rooms are furnished with comfortable beds and are sufficiently spacious. Colourful pictures on the walls of the rooms make the space interesting. The bathrooms are tiled and well-appointed with western sanitary ware. 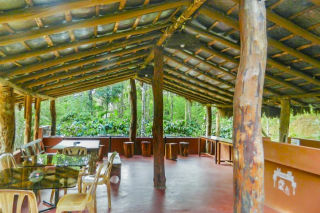 Featuring a raftered sloping ceiling supported on wood logs, the gazebo-style common dining area is a great space to relish meals in fresh air, with a view of the lush green surroundings for company. Porch sit-outs are ideal to savour some morning tea or coffee. Any kids accompanying you have ample space to play in sans PlayStations. There is a garden swing as well, should you wish to entertain that child in you who refuses to grow up! If you enjoy reading or fancy a restful nap in the open, the hammock is all yours—lie back, read, relax, or just be and let your thoughts flow! Amazing experience ! 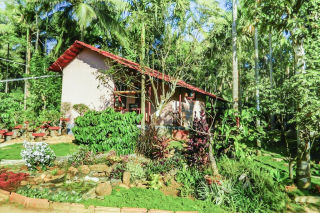 Suchitra Ji's hospitality and the the way she has maintained the home-stay is worth praising. The cottage, environment,mouth-watering food of your wish , local guidance are the other added advantages which she provides. 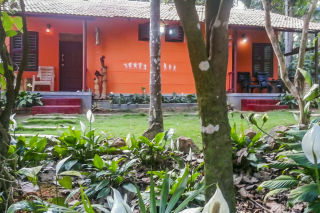 Our group stayed there for 3 days 2 nights and had a memorable experience. Highly recommended for a family or a group of old friends for a get-together away from city noise and pollution !! very helpful host. 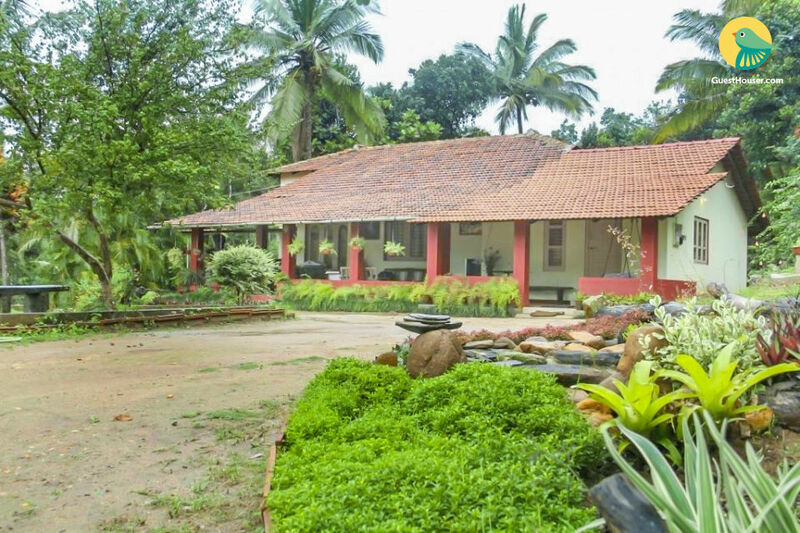 Made some beautiful frnds and memories here.